The unprecedented number of businesses taking the broom to their legacy systems and embracing the Cloud is undeniable. Google Apps and the Google Apps Marketplace have lifted IT out of a pit of “maintaining operating systems and malware software”, to creating new and exciting solutions for teams. IT is back where it belongs, creating real value for real businesses. The Google Apps Marketplace makes it easier to find the Apps you need, snap them into your environment and run with it. You don’t need to talk to anyone, negotiate a discount, hire a professional service team, call the customer support group, or wait until tomorrow. Lest we forget who came up with the concept of “Installing” a web app, and to what end. The value of instantly integrating previously different applications is massive and true to the mission. Today, software vendors, value-added service providers and clients are clustering around Google Apps to offer solutions that were not previously conceivable and Solve CRM has been there from the beginning. Thanks to you, Solve’s best-in-class Google Apps integrations such as the Gmail gadget, synchronization and email linking, have propelled Solve to be one of Google’s highest ranked marketplace apps. 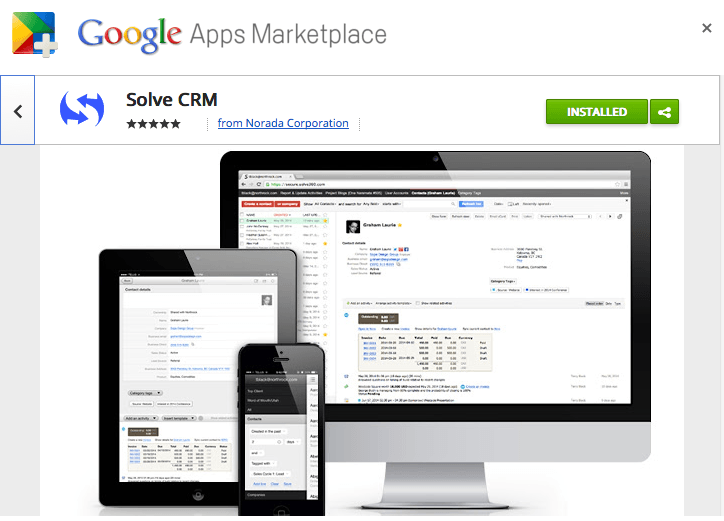 Google and Solve have made significant re-investments in modernizing their integrations through Google’s new Google Apps Marketplace. Continuing over the next month clients will be upgraded to the new integration. This is a big deal here, with lots of moving parts. Google and Solve have made it a priority to ensure the transition will be as seamless as possible. We’ll keep it simple, drop your Solve administrator and email with the details, and you’ll notice the Solve icon change to our new blue logo.